Bryn Elltyd Eco Guesthouse in the foothills of Snowdonia, Wales, UK has won an environmental prise in the Considerate Hoteliers Awards 2014 for its 100% renewable energy supply arrangements. Now powered completely by the sun, wind, biomass and water and with a zero carbon energy footprint, the six-bedroom guesthouse dates back to 1883. On-site energy production comes from an OkoFen wood pellet boiler for heating, which is integrated with solar water heating panels. The 25 kW boiler was installed by Menai Heating and was the first installation in Wales to begin receiving the UK government's Renewable Heat Incentive payments, in 2012. 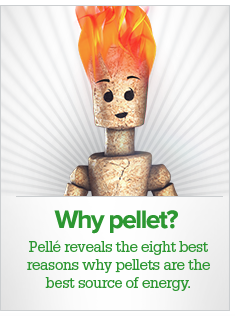 The boiler's pellet fuel is sourced locally from Clifford Jones, of Ruthin. Andy Boroughs, MD of Welshpool-based Organic Energy, which supplied the wood pellet boiler, praised the owners’ efforts saying that transforming an historic building into a trailblazer for sustainability meant they have ‘shown that being at the cutting edge of ecological responsibility is about commitment and creativity, not about size and resources’. As of this Wednesday, homeowners relying on expensive oil central heating in their homes will be offered payments of thousands of pounds to switch to renewable energy. Training programme geared for UK-based plumbers and heating engineers specialising in renewable heating and hot water systems. The modern heating circuit controller Pelletronic Touch and the innovative solar-pellet heating Pellematic Smart, stand for election.